I’ve almost recovered from the dizzy flu and the national disgrace of our male cricket team. This meant, I’ve finally spent some quality time on my bike and the new Campagnolo Zonda clincher wheels, I purchased in mid-July. As my readership would know, I’ve been suffering from severe upgraditis triggered by SBS cycling coverage. I’ve previously swapped out my pedals and shoes. Marv’s Wilier with Zondas fitted. After much ‘umming’ and ‘ahhing’ I decided that I really needed new wheels. As an aside much of what is written about wheel weight borders on twaddle. However, Leonard Zinn at Velonews seems to have a good grasp of the physics. For the record, lighter means faster…period and in wheels, heavier rims means they are harder to accelerate. So I swapped out the Fulcrum 7s for Campy Zondas. In theory, I should have reduced the overall weight of the bike by 300g. I bought the wheels last month from Cecil Walker’s Elizabeth St for $750. As, the wag in the bike shop said, ‘Mate, you’re swapping fake Campy’s for real ones’. I didn’t have the courage to attempt the fitting of a new cassette and the bike needed a service. So I forked out the $250 difference on Wiggle price. Unfortunately, the maintenance order I put at the front desk must have been communicated via ‘chinese whispers’ and the mechanic didn’t fit the Gatorskin tyres that I wanted. I changed over the tyres later. After 4 weeks of riding, I can say they were a good purchase. Initially, I had the tyres over inflated, so the combination of the new rigid rims and new tyres, gave a very harsh ride. The handling experience felt very jitterly. I was feeling amplified road conditions transmitted up the seat post, out of the rear frame geometry. It was only when the bike was travelling over smooth bitumen did the ride improve. Initially, I was thinking that I had wasted my money and was a bit grumpy. Happily as the Gatorskin tyre pressure decreased, the ride quality improved. I’m inclined now to inflate the tyre to 5-7 kPA lower than suggested by the manufacturer. In the last week, I’ve felt that bike is much quicker. The times on my Garmin seem to evidence this. Quite light 1550g or there abouts. Very robust, the moulded rim looks and has so far been indestructible. The sealed rim doesn’t require a rim strip. There was visible build quality difference between the Fulcrum 7s and Zondas. They seem to accelerate well and thanks to the hubs spin very smoothly. The front rim is slightly shallower than the rear, this seems to provide more responsive, windproof steering. The G3 spoke pattern on the rear wheel is IMHO aesthetically pleasing and seems to keep the rear wheel very stiff. The paint scheme also matched the silver, black and red scheme of my Wilier’s frame. Harsh ride if your tyres are over-inflated. If you break a spoke, you’ll need to have it fixed by your bike shop mechanic. The sealed rim means the use of magnet to re-thread a spoke. 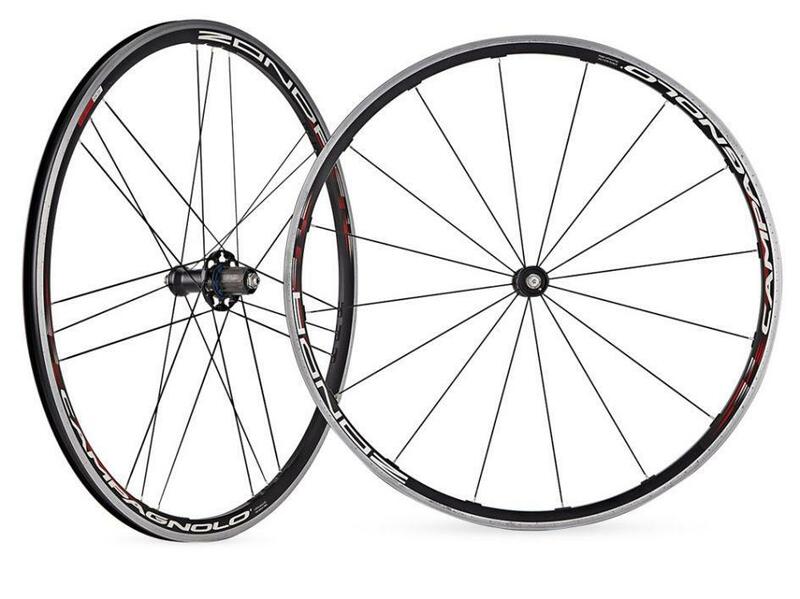 The spokes are proprietary, can only be sourced from Campy re-sellers. Being Campy, replacement parts are pricey, particularly compared to the Shimano. I’m giving them 4 Marvs. 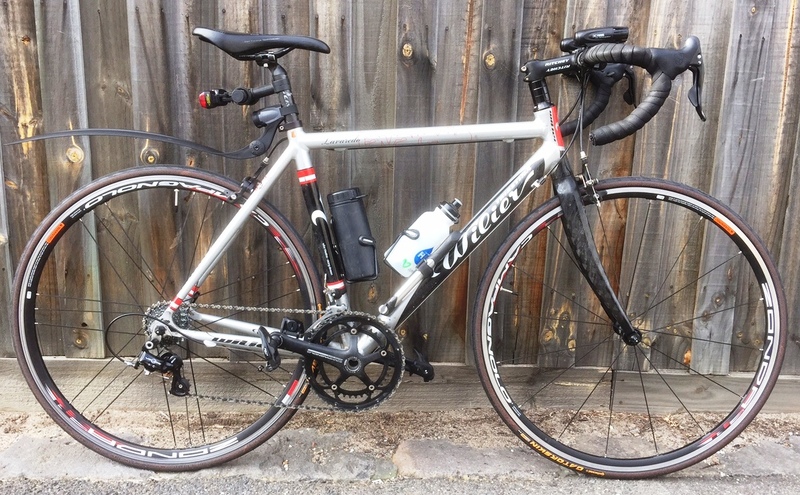 This entry was posted in Equipment, Maintenance, Product Review and tagged Campagnolo, equipment, Gatorskin, rims, tyres, upgraditis, Wheel set on August 14, 2015 by Marv.